When you’re a telecom provider, you can’t afford to have potential customers subscribing to your competitors’ services. Especially since many telecom bundles or packages require term contracts, meaning that you lose these prospects for a number of years. One of the nation’s largest telecom providers was losing out on thousands of potential customers as a result of outdated direct mail practices and declining response rates. Our client needed help crafting a proven and holistic approach to increasing response rates and came to IWCO Direct based on our reputation for providing this type of lift to our clients. Because this was a brand new relationship, we needed to both on-board the client from a production perspective, ensuring flawless execution; meanwhile, diving head first into building a new strategy that could be implemented as soon as possible to drive stronger results quickly. This meant everyone involved needed to remain nimble as the plan evolved, yet methodical in terms of quality control. 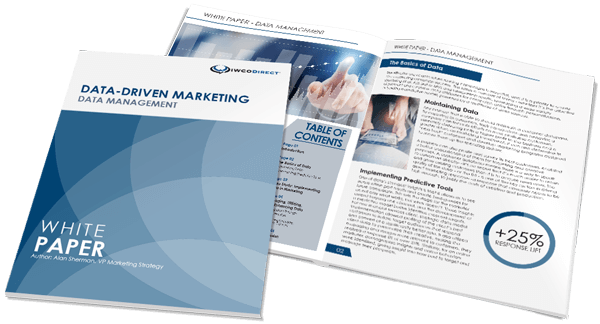 Adding further complexity was a need to educate the client on direct mail best practices and streamline the 50-90 versions that were generated manually each month. This created major inefficiencies and often put the schedule in jeopardy. Strategy: Right off the bat we worked with the client to begin implementing gross response rate (GRR) best practices. Formats are often the biggest driver of GRR lift, and we were able to share high-performing formats, as validated through multivariate testing (MVT) campaigns across multiple verticals, for the client to choose from. We also implemented a format rotation calendar to extend the life-cycle of each creative. Creative: Our in-house creative team developed a strategy that involved implementing design best practices such as packages with unique size and feel, interactive devices and proven letter layouts containing clear positioning of benefits to the consumer and increased urgency in the messaging. Execution: We converted the client from conventional to digital printing, speeding up the production cycle and providing the ability to implement more targeted segmentation and exponentially more versions. This reduced the strain experienced from the previous versioning process. We also implemented a commingling process that created significant postal savings and drove down postage cost per piece (CPP). Analysis: We worked with the client to provide results on an ongoing basis. This feedback loop has been critical in driving continued refinements and performance improvement with each campaign. Within the first six months of our relationship, IWCO Direct was able to provide more than 20% lift in average response rates and more than 35% reduction in cost per call, delivering critical leads to grow the client’s subscriber base. We have continued to sustain increased response levels on an ongoing basis. Group Account Director. Graduate of the Carlson School of Management at the University of Minnesota. Savvy marketing veteran who always has a “nothing is impossible” attitude. Die hard U of M Football fan who tailgates with a group of 30 alumni before every game. When she’s not cheering on the Gophers, she is busy taking part in outdoor activities with her growing family.